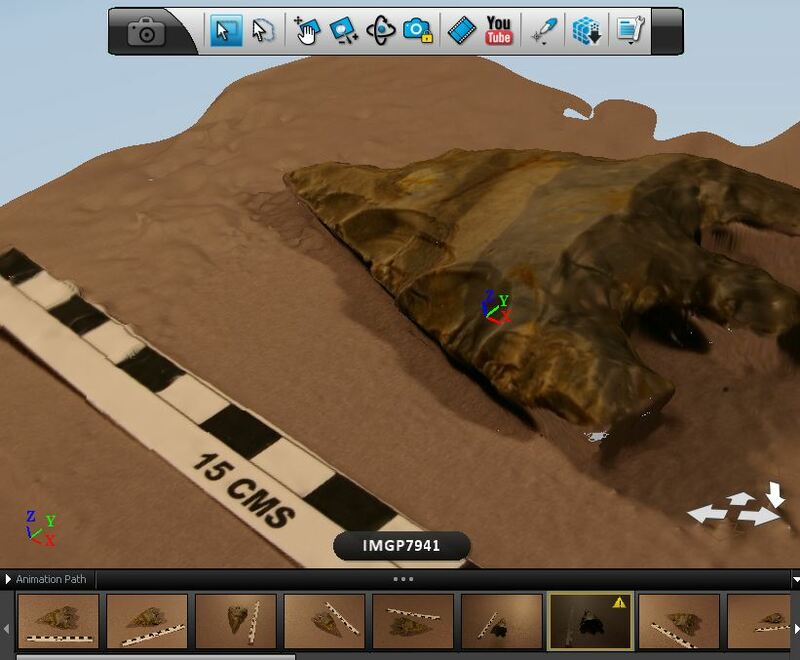 It is easy to use: Unless you are dealing with something extremely large or extremely complex, Photogrammetry has an extremely high success rate. When it was still based on camera calibration, complex calculations and precise measuring was necessary, but with more modern programs often all that is needed is to take the photos and upload them. Decent models are easy to produce, and more complex ones are achievable without issue with some experience. Overall, anyone could potentially use it in small scale archaeology with no experience, and on large scale with limited training. It is quick: With a good internet connection I can probably model a single feature in under 10 minutes. And by single feature I mean anything from a posthole to a stone spread. In situ finds could be recorded in no time, cutting back on the need to plan everything by hand. A complex stone wall could be preserved for the archaeological record simply by taking a few dozen photographs, and sections can be recorded with much more realism than any hand drawn plan can achieve. A rough sketch of the section would of course help the interpretation, but the measuring time would considerably go down, as it would be possible to measure on the model using Meshlab. It is practical: Laser scanning is the current fashion in archaeology, but the problem with laser scanning is that you need to provide expensive equipment, you need to carry that equipment around and need to train specific people to use the machines and the software. 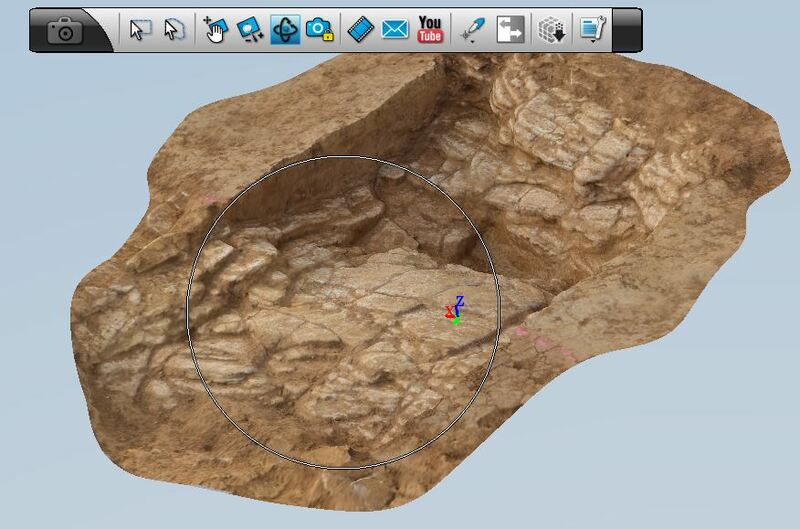 Photogrammetry requires nothing more than a camera and a laptop, which are usually much more accessible on site. If a delicate object is found, that may not survive excavation, it is much easier to take some photographs with the site camera, to then edit later, than to bring in the equipment to laser scan it. It is accurate: As shown in one of my recent posts, the accuracy of 123D Catch is extremely good for the type of process. Although it cannot compete with that provided by laser scanning, an error margin of less than 1% means that any task required for interpretation can be carried out without having to worry of the results. The level of accuracy is ideal for presentation, for interpretation and for recording. It is photorealistic: No other technology gives you the photorealism that can be achieved by Photogrammetry. Due to the fact that at the base of the models we have the photos, and that the finished product contains .mtl files that record the exact position of the photographs, the surfaces of the features can be recorded as they are in real life. The models seem realistic because they are not a simple collection of points, but a combination of points and images. It is entertaining: Archaeology is not simply about recording the past, it is also about getting the information out there, to the general public. It is important that anyone interested in an archaeological has the opportunity to learn about the site itself. Academic texts are amazing when carrying out research, but for the average archaeological enthusiast, who lives in a now mostly digital world, texts can be seen as confusing. Photogrammetry provides a visual component to the archaeological record, making it possible for people to see from their own living room the archaeology, as if they were actually present at the site. It is constantly improving: At the moment there are some problems and flaws with the programs that may cause concerns to more traditional archaeologists. These problems however are only temporary. With such a great interest in the digital world, teams of developers are constantly trying to update and improve all software, and if at present programs like 123D Catch are not perfect, they can only get better. Also, 10 years ago this level of accuracy in Photogrammetry was unheard of, yet today it has got to this point. In another 10 years how much will the programs change for the better? It is not as simple as it looks, in a good way: There are different levels to Photogrammetry. The basic level is the simple recording of features and artefacts for the only reasons of recording and presenting. There is however a second level, which uses the models created to analyse archaeology, like I show in my previous post about finding inscriptions in coins. There is a third level, which alters the way the programs are used, by changing a part of the process to get greater results. An example is the attempt I did on reconstructing the Sphinx using tourists’ photographs, or the idea of using series of photographs in archaeological archives to reconstruct features long gone. Finally the fourth level is the more interesting one. It’s using many Photogrammetric models to create a single model, i.e. 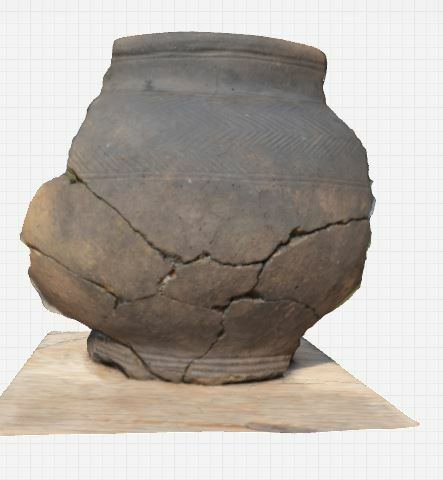 recreating pots by putting fragments together digitally or entire sites by gluing together individual features. So it is not only pretty models of features, it is much more.